I really think using pretzel sticks as edible toothpicks in these bites is just completely genius. I love it! I think there are a million other appetizers I could do this with. And I will. 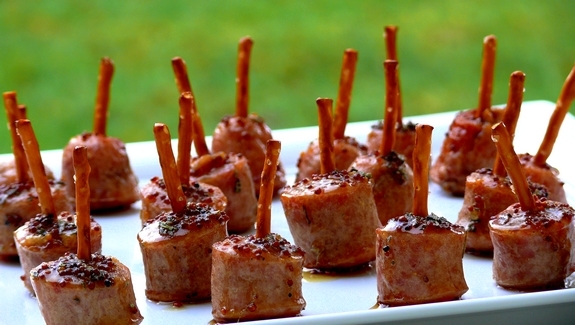 Anyway, these sausage bites are very good party starters. The sage really gives them a great taste when combined with the maple and mustard mixture. These are simplicity at its finest, just what we need this time of year. This recipe makes about 20-24 bites. It can easily be doubled or tripled for a crowd. 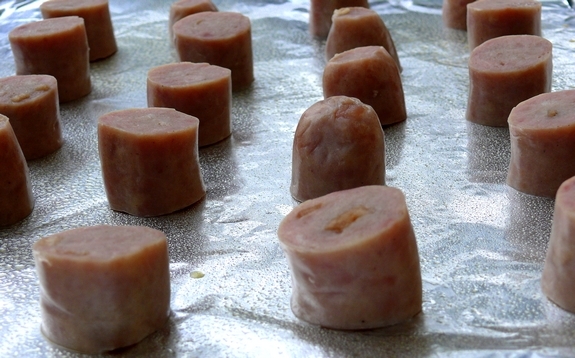 Preheat oven to 375o F. Cut sausage into 1″ slices. Place on a rimmed baking tray. 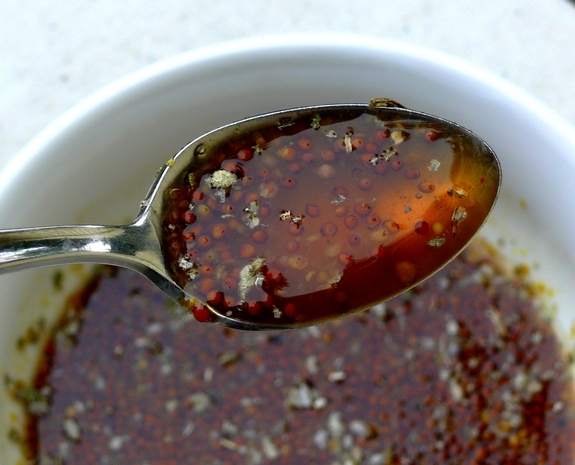 In a small bowl, combine maple syrup, mustard and sage. Bake sausage for 8 minutes. Brush generously with maple glaze. Bake 8 minutes more or until sausage is heated through. 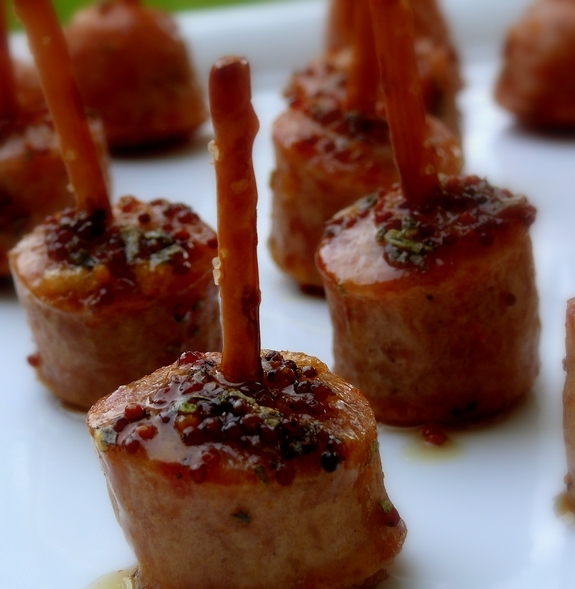 Use pretzel sticks as edible toothpicks to serve sausage slices. Preheat oven to 375 degrees F. Cut sausage into 1" slices. Place on a rimmed baking tray. In a small bowl, combine maple syrup, mustard and sage. Bake sausage for 8 minutes. Brush generously with maple glaze. Bake for another 8 minutes more or until sausage is heated through. 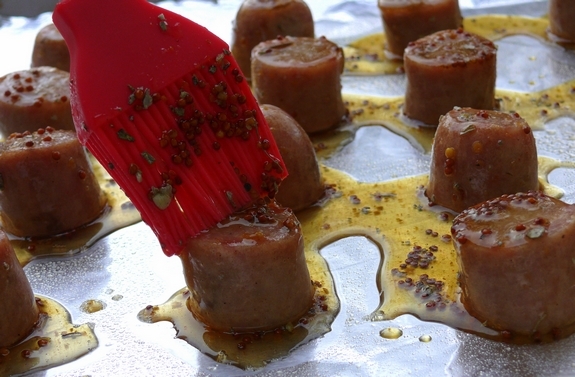 Use pretzel sticks as edible toothpicks to serve sausage slices. these look delicious, what a great party appetizer! I am so making this for New Year’s Eve – thank you so much! I love the pretzel ideas…I think they should use that in store sampling too! Thanks for a splendid year of amazing recipes!! Genius! All of it! Fantastic idea and so simple! I love this idea. The sage and maple and the pretzels makes this such a kid friendly food. Wow, these look delicious! Can’t wait to try these. I love the idea of using pretzels as toothpicks. This solves the problem I invariably have at cocktail parties of what to do with the toothpick when finished with a quick bite on the move–and one can eat the evidence when, strictly speaking, one might have had a few more of those tasty sausage bites than politeness would technically allow! Wow! love this recipe. Pretzel sticks are a great idea! Thanks for sharing. These will be perfect to make for the Pats vs. Jets football game tonight!!! I love the pretzel idea!!! What a brilliant little appetizer! What a tasty appetizer. I love that you used the pretzels instead of toothpicks. Looks tasty! thanks for sharing the appetizer. For parties would this go well in a crockette? The sauce sounds amazing and who doesn’t love sausage with syrup? My kids will gobble this right up. I made these this afternoon for my son’s piano recital/holiday gathering. I walked in and put them down on the table and several of the tween girls stopped mid-sentence and said, “what are THOSE?” and then, they were gone. Luckily I save all of the end bits for us to have during the football game tomorrow. I doubled the recipe and you don’t really need to double the sauce- more like add another half of everything to make enough glaze for the sausages. YUM. Definitely making those again. i am having trouble finding the apple flavored chicken sausage links, can anyone tell me where they can be found or recommend a good substitute? they are Apple chicken sausage and can be usually found near the bratwurst, Italian sausage section. Chicken links are smaller and found near the breakfast sausage section. Well, they are at every store I shop at and I live sort of rural. So, maybe just chicken sausages. Looking for some easy apps for Thanks Giving and came across these lovely looking bites. Can see this is a few years old, can anyone tell me if these are any good made ahead and served at room temp, or is straight out of the oven best? Out of the oven is how you want to serve them. Thanks for dropping by. Looks like this is an old post, but has anyone made this with breakfast syrup like Mrs. Butterworth’s ? Or is Pure maple syrup a must? Just made them for a group of football fans and they went through them like a buzzsaw. Go Penn State! Can I make them a little in advance, warm them up in microwave, and then put pretzel in?